From left to right: Seema Dhanani, Chief Representative Officer, MCB Kenya, Alain Law Min, Chief Executive Officer, MCB Ltd and Jean-François Desvaux de Marigny, Chairman, MCB Ltd.
NAIROBI – Mauritian-based MCB Group, through its representative office situated in Nairobi, aims at positioning itself as a strategic partner of businesses in East Africa. The Group’s new representative office were officially opened in January and has given the opportunity to a 16-person strong delegation from Mauritius, led by MCB’s CEO Alain Law Min and board chairman, Jean-François Desvaux de Marigny to travel to Kenya. This strong presence on Kenyan soil is a strong statement of MCB’s assessment of the East African market in terms of business potential. MCB Kenya representative office is spearheaded by Mrs Seema Dhanani, Chief Representative Officer. Alain Law Min, CEO, MCB Ltd, thinks that Kenya has great potential for business and is appealing to the Group. “We want to position MCB Group as a strong and competitive regional financial hub, leveraging Mauritius as an international financial centre of repute and substance. We are keen in enriching the appeal and adaptability of our value proposition across markets and segments, whilst upholding organization-wide synergies and collaborative partnerships. We believe we can create and develop fruitful partnerships with the business community here. Whilst there is no immediate intention to open branches and banking halls in Kenya and East Africa, the Nairobi Rep office will enable MCB to better gauge the opportunities and develop strong relationships in this region. Our presence has so far enabled us to forge partnerships with banks and corporates and hence develop our banking and non-banking product and services offers. In this respect, our Kenya rep office can be a doorway to Mauritius and MCB Group, and our array of products and services can be put to good use by Kenya corporates and banks as well”. 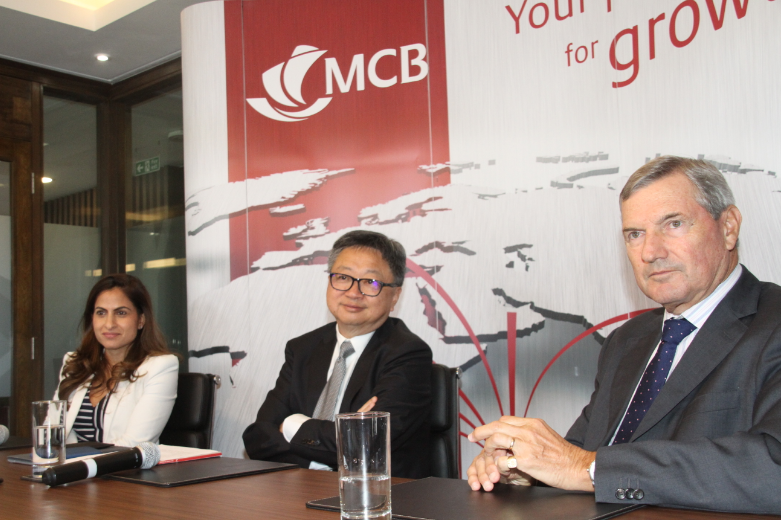 From a single bank, MCB has grown into a Group with a total asset worth of USD 12 billion. MCB Group is the holding company of several subsidiaries and associates that operate under three business clusters: Banking, Non-Banking Financial and Other Investments. Banking activities are present in Madagascar, Mozambique, Reunion Island, Mayotte, Paris, Seychelles and Maldives, with a network of around 1250 correspondent banks across the world. The Non-Banking Financial sector is involved in Factoring and Leasing while the MCB Capital Markets Ltd offers services such as Corporate Finance Advisory, Asset Management, Stockbroking, Private Equity and Registry. The Group also assists Micro and Small Entrepreneurs. The Group is present in nine countries and is actively involved in sub-Saharan Africa through participation in major cross-border deals and its ‘Bank of Banks’ axis, which aims at positioning it as a regional hub for handling trade finance, card operations and consulting services linked to project management and high-end IT solutions. This initiative stems from its intent to be a one-stop shop for banks. Through this formula, MCB has successfully established a winning business and operational model. Given that we have developed significant spare capacity, a strategy has been devised to give your bank access to these through valuable collaboration”, added Mr. Law Min. MCB receives a host of recognitions and accolades on a regular basis. They include The Banker’s ‘Bank of the Year for Mauritius’ for six times during the last decade and the Euromoney Awards for Excellence 2018 as ‘Best Bank in Mauritius’ for the fifth consecutive year. The bank is currently rated 1st in East Africa and 19th in Africa in terms of Tier 1 capital.